The Propylaeum is an historic mansion that was built in 1890. Our grounds include the mansion, carriage house, lawn, and parking. The home is the largest residence remaining on Delaware Street in the Old Northside neighborhood of Indianapolis at approximately 16,000 sq. feet. 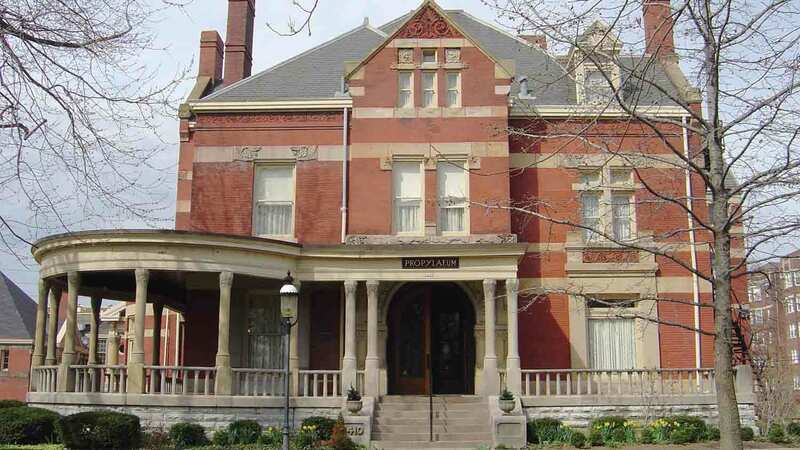 Beginning in 1923 the home was used as the Indianapolis Propylaeum Club, a private woman's club, where women could meet for the purpose of arts and culture and civic engagement. The Propylaeum Club was started in 1888 by May Wright Sewall who was a leading suffragist and women's rights activist. Today, the Propylaeum is a nonprofit organization with the mission of arts and culture, women's leadership, and, of course, our beautiful historic building. This beautiful venue is available for venue rental for teas, parties, corporate events, or boutique weddings. We are open for lunch weekdays from 11-2 and self-guided tours of the mansion and grounds are always encouraged.